April Is National Safe Digging Month - Summit Utilities Inc.
National Safe Digging Month was designated to remind everyone that our land is made up of a complex underground infrastructure of pipelines, wires and cables. One free, simple phone call to 811 makes it easy for your local 811 Call Center to notify all appropriate utility companies of your intent to dig. Call at least 48 hours prior to digging to ensure enough time for utility lines to be properly marked. 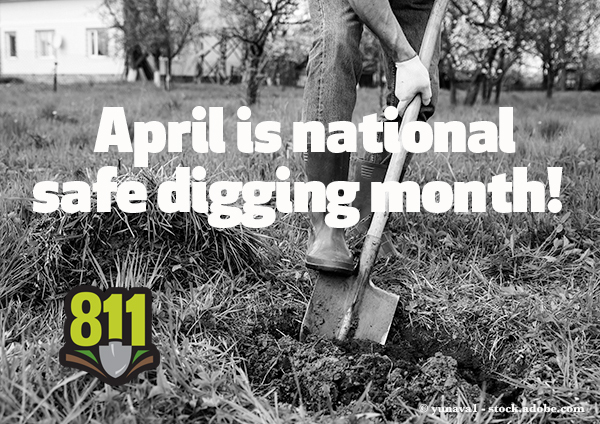 When you call 811, a representative from your local 811 Call Center will ask for the location and description of your digging project. Your local 811 Call Center will notify affected utility companies, who will then each send a professional locator to the proposed dig site to mark the approximate location of your lines.